A Melbourne tram is the best way to navigate this vibrant city, surrounding precincts and attractions. Trams are convenient and frequent. You can hop on and off different lines and connect in different directions. Trams are best suited to shorter travel, but you can also use them to journey into the middle suburbs - although that can be rather slow. Trams are more than just a means of transport in Melbourne. They are an icon, a central cherished part of Melbournes distinctive character. Most Melburnians are fond of their trams. When you travel by tram you are part of the citys life  it can be interesting and entertaining. 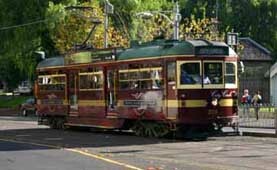 Melbourne has the third largest tram network in the world, with an impressive 245 kilometres of track and 500 trams. Most trams run in a radial fashion from and through the city. Here is more Melbourne public transport and ticketing information, and a map of the Melbourne's tramlines. You get the restored old style trams around the city circle, the famous green and yellow models around Richmond, South Yarra and Prahan. The plain grey 70s trams and a variety of new models are running on most of the other tracks. Here are all the tram types with pictures that are operating in Melbourne. 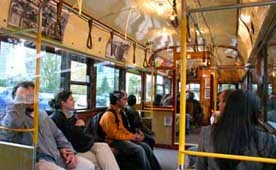 One of the old-style trams is used as a hop-on, hop-off free City Circle tram. This takes you around the city quadrant and into the Docklands. It is a good way of familiarising yourself with the city as it has announcements about points of interest and attractions on the way. This picture is taken inside the free City Circle tram. The same type of tram is also used as the Melbourne tramcar restaurant where you can wine and dine while traveling around the city in the old style tram. The first tram in Melbourne  a cable tram - began operating in 1885. The cable tram network grew over the next 55 years to an impressive 75kms of track and 1200 cars and trailers. It was comparable to the tram networks of San Francisco and Chicago. In 1906, electric trams began operating as well, originally functioning as feeders from the suburbs into the city cable system. In 1889, there had been an electric tram line in Box Hill, but this survived only seven years. During the 1970s, Melbourne almost lost its trams. Luckily some person of influence had the foresight to stop the onslaught of progress, which at that time meant getting rid of anything old. Since then, there has been a privatization of the tram network, and the usual ups and downs of funding and government  but the Melbourne tram is here to stay.